New York, September 17, 2017 -- The Mali Elephant Project, a joint project of ICFC and WILD Foundation, was among fifteen winners of the prestigious Equator Prize awarded in a gala ceremony in New York on Sunday, coinciding with the 72nd Session of the UN General Assembly. Organized by the United Nations Development Programme’s Equator Initiative, the Equator Prize is awarded biennially to recognize outstanding community efforts to reduce poverty through the conservation and sustainable use of biodiversity. The winners each receive a cash prize and are brought to New York for several days of meetings and workshops in advance of the award ceremony. This year’s winners are protecting, restoring and sustainably managing marine, forest, grassland, dryland and wetland ecosystems, while creating jobs and livelihoods, protecting endangered wildlife, and decreasing risks from natural disasters. Since the inception of the Equator Prize in 2002, there have been more than 5,000 nominations and 200+ winners. In a drought-prone zone rife with resource conflicts and violent extremism, the Mali Elephant Project brings together various ethnic groups to effectively manage local resources and protect an internationally important population of 350 endangered African elephants. Through the formation of community-based natural resource management committees, the provision of additional income through support for women’s groups engaged in sustainable harvest of non-timber forest products, and anti-poaching measures involving 'eco-guardian' youth community members, the initiative has reduced poaching of elephants in the 32,000 km² area, improved social cohesion between different local communities, and contributed to peace-building efforts by providing alternatives to joining extremist groups. Communities have created rules for local use of natural resources, set aside forests for elephant use, formed pasture reserves, and designated seasonal water sources to be shared by people, livestock, and elephants. 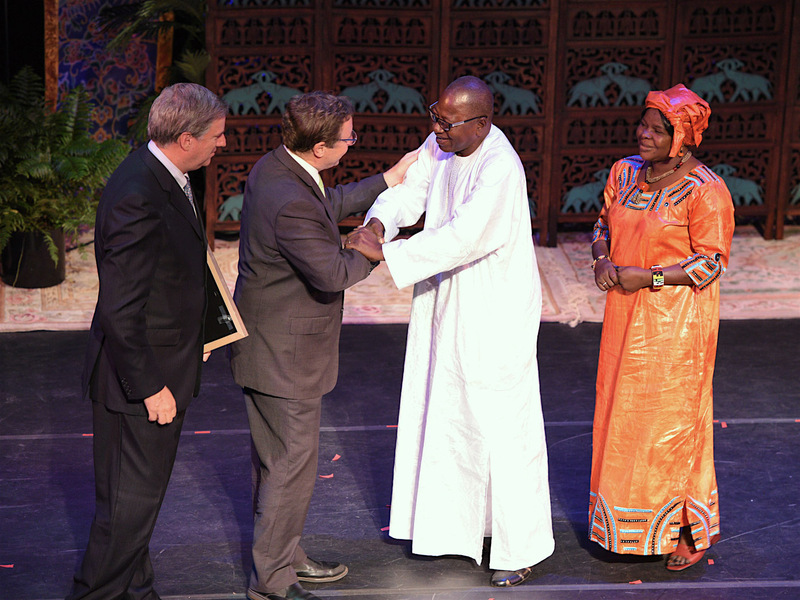 Accepting the award for the Mali Elephant Project is project field coordinator Nomba Ganame and Aoua Cherif Doumbia, a colleague representing the government of Mali who specializes in supporting women in bee-keeping. Presenting the award are Cristián Samper, CEO of the Wildlife Conservation Society (left) and Achim Steiner, Administrator of the UN Development Programme. The award ceremony featured three videos produced by the National Geographic in partnership with Equator Initiative, on the theme of local action to conserve forests; grasslands, drylands and mountains; and oceans. Among the distinguished speakers were Mary Robinson, President of the Mary Robinson Foundation and former President of Ireland, Ángel Gurría, Secretary-General of the Organization for Economic Co-operation and Development, and Gary E. Knell, president and CEO of the National Geographic Society. ICFC has been the core funder of the Mali Elephant project since 2010, co-managing the project with U.S. based WILD Foundation. ICFC Executive Director Molly Bartlett said the organization is proud of this recognition and believes that the project illustrates the efficacy of the organization’s approach of selecting the best conservation opportunities and local partners in its global conservation efforts. 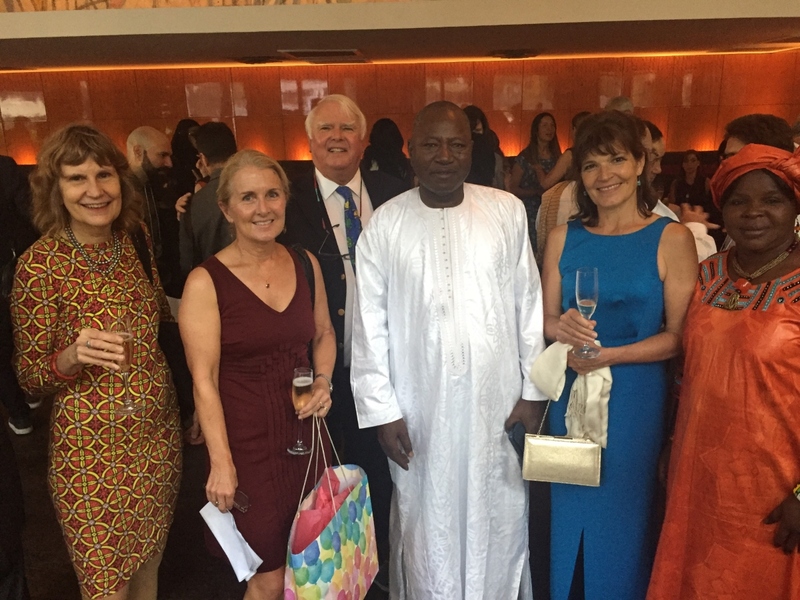 Attending the the reception before the award ceremony are Anne Lambert, Molly Bartlett, Tom Welch, Nomba Ganame, Susan Canney and Aoua Cheri Doumbia. 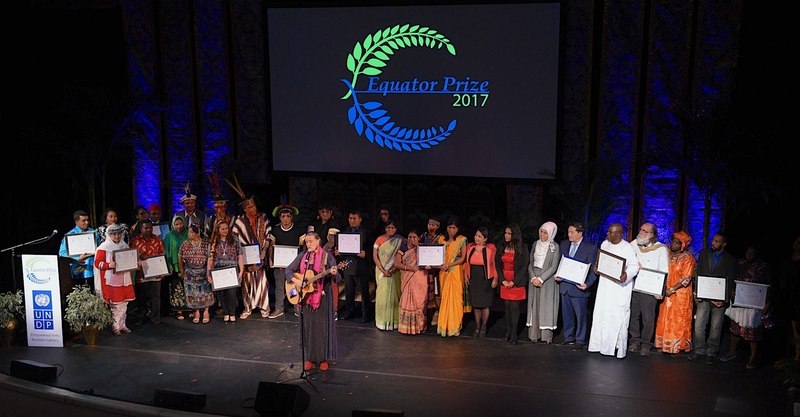 Representatives of the fifteen winners of the 2017 Equator Prize came to New York from twelve countries around the world.